Close to the capital of Phnom Penh and only 8 kilometers from the Phnom Penh International Airport is the Royal Cambodia Phnom Penh Golf Club. 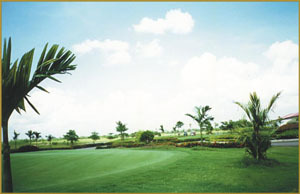 The 7,075 yard golf course is spread out over 200 hectares and nestled in amongst rice paddies and coconut palms. Being so close to the capital it is a favorite with locals and expatriates. 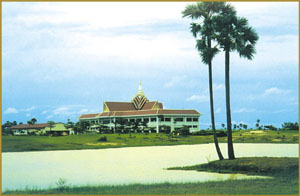 Moreover since opening in 1999 Royal Cambodia has hosted numerous dignitaries and celebrities. In fact it is Prime Minister Hun Sen's preferred course as he got a hole-in-one at Royal Cambodia in 2004! The Cambodia golf course emphasizes environmental protection as has preserved many of the original land features and used native palms, flowers and bushes to make the course shine. Moreover, since some of the course plays through natural wetlands there are many birds that graze in the on-course ponds and streams. 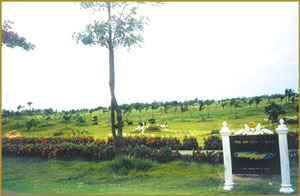 The international standard golf course features 18 holes that are each unique. The course is rather flat yet it still provides a challenge with numerous sand and water hazards, including a large lake near the third hole. Four tee boxes allow for a wide range of distances to be played and welcome golfers of all levels. Water comes into play on 12 of the 18 holes and nice greenside bunkering promotes accurate shots into each of the undulated greens. The large Royal Cambodia clubhouse combines the traditional Cambodian architecture with modern convenience. 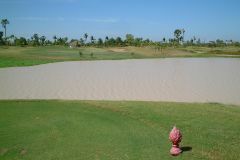 Facilities are adequate for most Cambodia golf visitors. 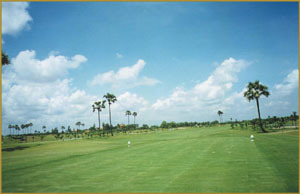 The golf driving range is one of the largest in Phnom Penh and a good place to warm up before your round. Have you played golf at the Royal Cambodia Phnom Penh Golf Club and took some nice photos that you would like to share with other golfers? Send them to us and we may upload them here. Thank you in advance!